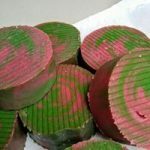 2 Farm Boys is a family owned and operated goat farm and soap making company located in the Heber Valley. 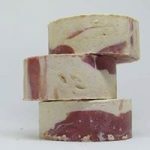 Our soap is made using the goat milk right from our own herd of Nigerian Dwarf and Mini LaMancha breeds. We hand milk, hand make, and hand wrap all of our soap. 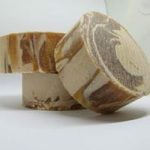 Small batches ensure the quality of the soap and no two bars are exactly alike. 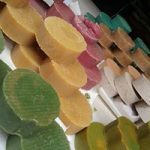 Nourishing oils have been selected to increase the conditioning qualities in our soap and pair well with the beneficial properties of goat milk. Together, they make up a great, long-lasting bar with creamy lather enhanced by the wonderful fragrances in our own original recipe. This soap is amazing! I use it on my kids and it has helped their eczema so much. Plus it smells amazing and makes my skin so soft too! Our story started with a small problem that needed a solution: a canal bank that had overgrown with weeds and needed trimming. It is a well-known fact that goats are great weed eaters and we quickly acquired three to do the job. The intent was to sell the goats at the end of the summer, but our family had grown to love these curious, sweet animals so much that we decided to keep them. We added two more, including a buck that would allow us to breed them. 5 turned into 14 and soon, 14 turned into our current herd of 25! As with all our animals on the farm, they needed to serve a purpose, but the weeds were all gone, so what would the goats contribute to our farm? A friend suggested we make goat milk soap, something I was not familiar with. So, after reading books, watching tutorials, and numerous failed attempts, 2 Farm Boys soap company was born. 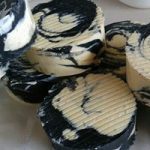 We have been making, sharing, and selling soap for over 2 years now and continue to add new goat milk products to our store. This entry was posted in Body and tagged body, Goat Milk, soap on November 10, 2017 .